ReBecka is a native of Casselton, North Dakota. She joined the firm in 2017 as a civil litigation Paralegal for Attorney Scott Porsborg and his associate attorneys Brian Schmidt, Sarah Kuntz, and Austin Lafferty. 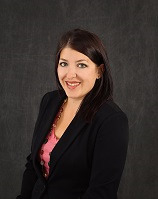 ReBecka attended Minnesota State University Moorhead, where she graduated in 2010 with a Bachelor of Science degree in Paralegal with emphasis in estate planning and civil litigation. Prior to joining the firm, ReBecka gained experience in estate planning, WSI claimant’s rights, personal injury, and family law. ReBecka resides in Mandan with her husband, Zack and two children, Rylee and TJ. She enjoys playing volleyball and hockey, attending concerts and sporting events, camping, and canoeing.